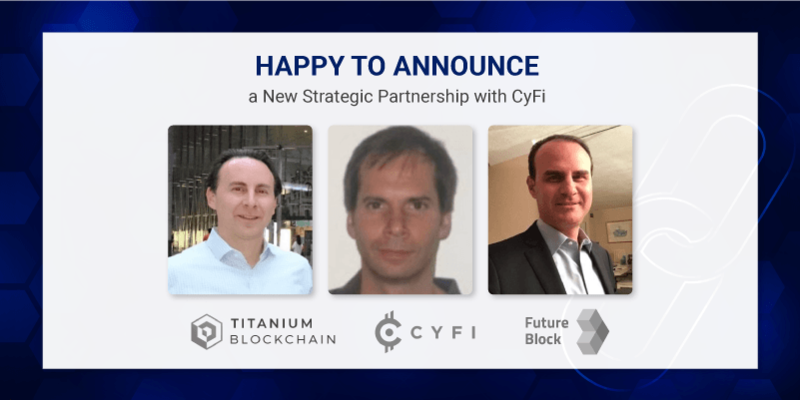 Titanium Blockchain is pleased to announce its new strategic partnership with CyFi – a hi-end portfolio management system designed specifically for the digital assets ecosystem. The easy-to-use platform empowers individual investors to make informed decisions through a suite of analytics, charting, news, research and trading tools that enable users to efficiently manage portfolio holdings and uncover emerging investment opportunities. Co-founders Akiva Katz, Bernard Hutman and Michael Hutman leverage their domain experience in capital markets and investment management, in conjunction with Titanium’s blockchain and software development expertise to launch the portfolio management system geared towards the emerging securities tokens markets – a global US$ 500 trillion market opportunity. CyFi is primarily focused on the retail investor base, who currently lack an affordable, yet comprehensive platform, that offers well-rounded investment research and analysis capabilities beyond portfolio and trading apps currently available. Titanium is a Blockchain ecosystem, that offers tech, product, BizDev and investment to Blockchain companies.